This is the big one. When choosing out shoes, jewelry, clutches, wraps and other accessories for the big day, consider other occasions when you might wear them. For me this is the easiest. As a fashion blogger, I have a number of events (such as Bellevue Fashion Week, where these photos are from) where a piece of fancy jewelry, bag or shoes is relevant. 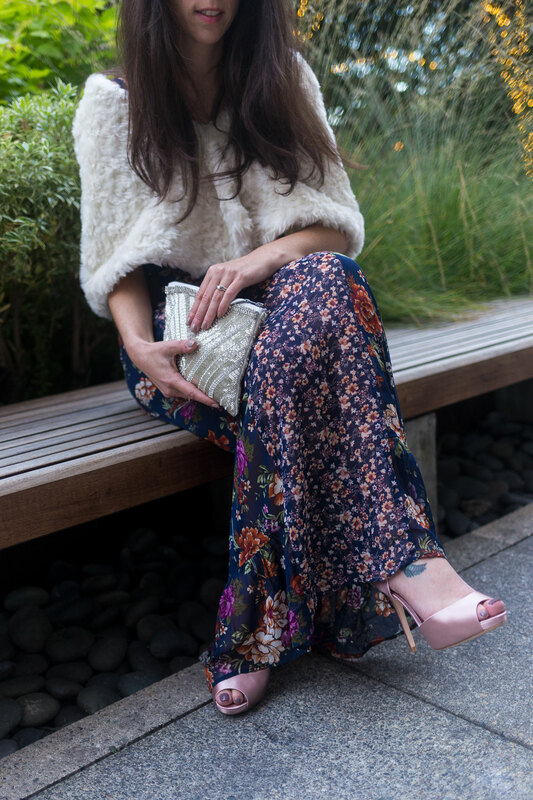 At last year's Bellevue Fashion Week I paired a budget-friendly dress from Target with my wedding day earrings, clutch and faux-fur stole, all from BHLDN. BHLDN is where I found most of my wedding day jewelry and accessories. I had also planned to wear the shoes in these photos on our wedding day, but because we settled on a vineyard for our venue, a pair of wedges proved a better choice. However, I loved these heels so much I kept them for fashion and fancy events. Really set on a certain necklace or pair of earrings, but find them a bit to fancy for after the wedding? Consider transforming them into everyday pieces. Take a stone or diamond from your wedding day accessory and make a ring or bracelet that can be worn on the daily. When you look at it, it will always remind you of your love and beautiful celebration with friends and family. Really, shoes are super easy for choosing something you will wear after. Many dresses completely hide the shoe, so most guests won't ever even see what you're wearing. Cowboy boots more your style? Do it! Prefer sneakers? I've seen it done more and more! Most importantly, even though it's a special day, stay true to you and don't stray to far from your typical style. This will allow you to treasure and wear your wedding day jewelry and accessories always and forever. And of course, the goal of your wedding day is to look and feel the best and most beautiful version of who you always are. Have suggestions on reusing Wedding Day jewelry and accessories beyond the Big Day? Wedding planning tips? Please leave them in the comments! Your blog is very good, the clothes you share, look beautiful, I like your blog very much, I will take a look at it often.